The 10 Best Consignment Shops in Utah! 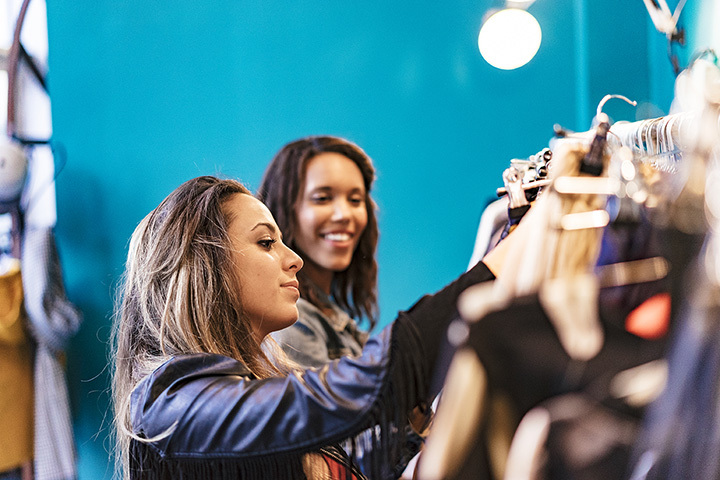 There are numerous benefits to shopping at consignment stores—not only is it environmentally friendly, it is also great for your wallet, and in many cases, potentially good for your soul. Shopping at thrift and consignment shops is extremely popular in Utah, so if you find yourself looking for an accessible and rewarding shopping experience, the following 10 consignment shops are worth exploring. Name Droppers has two locations in Salt Lake City, and in addition to a monthly “end of the month” clearance sale, one of Name Droppers’ most attractive qualities is its impressive selection of designer brands. This shop is definitely not what you think of when you think of a thrift shop—step through its doors and you’ll likely find lightly used Jimmy Choo’s or pristine Chloé bags, all at a fraction of the cost of retail prices. It might sound cheesy, but Home Again really does make you feel as if you’re coming home, or at least that you’re coming home to someone else’s house that you’d also probably want to live in. The shop is quaint and inviting, and its unique inventory will inspire you and consistently tempt you to make some spur of the moment decisions about how you want to furnish and accent your own home. Pebbles & Twigs has become enormously popular with consignment shoppers in recent years—its two locations (Provo and Park City) are well-frequented, but are also well-stocked and consistently re-stocked. The fast pace of this consignment shop has inspired many to make it a part of their weekly or semi-weekly shopping routine, because at Pebbles & Twigs, you never know what you will find. Forget Me Not Consignment sells gently-used women’s clothing and accessories, prom dresses, and Halloween costumes. Rest assured, any time of the year is a good time to visit the shop, because its inventory is always in quick circulation. If you want to clean out and update your closet in one swoop, bring your unwanted or unworn clothing to Forget Me Not Consignment in exchange for cash. If you love dressing up for Halloween parties, festivals, or conventions, you should check out one of Pib’s Exchange’s two locations in Salt Lake City before you head anywhere else—Pib’s Exchange has an incredible costume shop, and you can breathe a little easier knowing that you’re reusing something that could have very well been wasted after one wear. Hidden amongst more industrial shops in downtown Salt Lake City, Decades Vintage Clothing is a popular destination for committed consignment shoppers who are also passionate about vintage pieces. There are plenty of good deals to be had at Decades. Sell it Again Sally is one of St. George’s most popular consignment shops. It appeals to home buyers, renters, movers, and home stagers for many reasons, but especially because the shop has a reputation for focusing on quality. You will not find dinky, used furniture at Sell it Again Sally. Likewise, it only accepts gently used furniture to consign. One of the main benefits of shopping at Tressa’s Consign & Design in Park City is that you’ll actually be able to work with the shop’s owner, who is known for her helpfulness and general, furniture and design-related knowledge. You can consign unwanted items at Tressa’s shop, search for new items you want to buy, benefit from Tressa’s interior design knowledge, and get old pieces re-upholstered. This Salt Lake City consignment shop will take your gently used outdoor gear (bikes, skis, rock-climbing gear, etc. ), clean it, take professional photographs of it, research, and create a listing in its eBay store in order to sell your items. Of course, you make a profit when your items sell. But the best part is, you don’t have to do any of the work. Lost and Found Thrift has an impressive following. Odds are, the shop will always have something that interests you in some way, and when you meet the store’s owners, you’ll find yourself wanting to come back. Lost and Found Thrift has a genuine, neighborhood vibe that attracts people from other Utah cities and even from neighboring states.